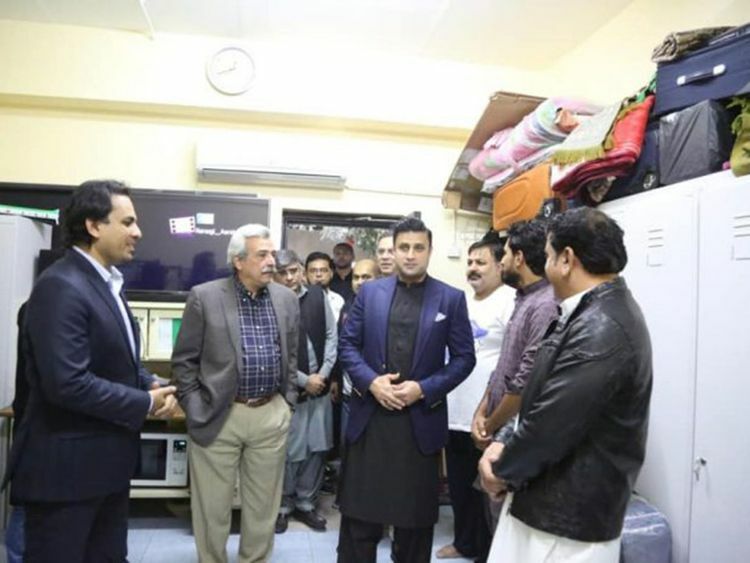 Dubai: Hundreds of blue-collar Pakistani workers were surprised to see the Zulfiqar Bukhari, Special Assistant to Prime Minister on Overseas Pakistanis and Human Resource Development, at their accommodation in Dubai on Saturday. Bukhari visited Khan Saheb Workers’ Accommodation in Jebel Ali to interact with the Pakistani workforce. Ambassador of Pakistan Moazzam Ahmed Khan and some prominent Pakistani businessmen in Dubai accompanied Bukhari. The visit was first of its kind by any minister by Imran Khan’s government. “We are happy to see someone finally visiting us,” a worker told Gulf News after the Minister’s visit. “He listened to our issues we face back home but we skeptical of any action by our government because successive governments in Pakistan have made huge promises for overseas Pakistanis but we are always neglected,” said the worker who does not wish to be identified. During the visit, Bukhari interacted with the workers and reviewed their accommodation, dining and prayers facilities to get an overall picture of the provisions being offered to the workers by their employers. In his brief address to workers, he said: "You will soon feel a sense of ownership. The government is standing behind you and you have to stand up for your country and serve it in whatever capacity you can." Bukhari told workers to send remittances through legal banking channels instead of using illegal means as this will help their country build foreign reserves. Bukhari also stated that taking care of the workers was the responsibility of the Overseas Ministry and assured that the government vowed not to isolate their workforce working far away from their homes. He said the aim of his visit was to understand the problems of Pakistanis working in Gulf countries. Bukhari will also address a businessmen in Dubai on January 27.